Mattress360 has searched far and wide to bring you the very best in comfort and luxury bedding and that includes pillows. Partnering with some of the top pillow manufacturers around the world, our inventory consists of pillows made to give you extra support at night while also improving your body’s natural sleep processes. No matter what kind of pillow you prefer, there is something here for you! Innovative gel-based pillows are becoming increasingly popular for their combination of ergonomic support and the cool comfort they provide. 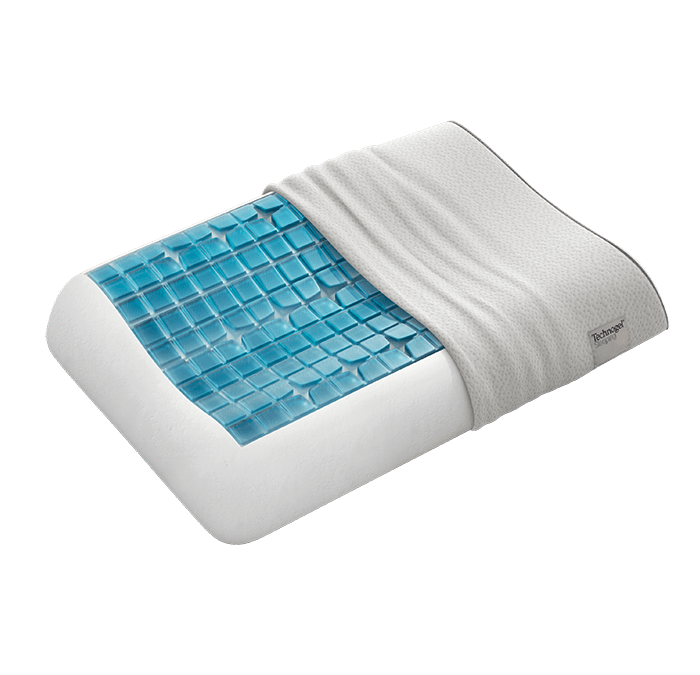 TechnoGel uses a patented gel blend on top of a memory foam base to create cooling, comfortable pillows. Their pillows come in many different contour options, so you can find the one that best fits your natural sleeping posture. The Anatomic pillow is specially curved to support the neck, back and shoulders for those who experience pain and discomfort in these areas. The Deluxe Thin pillow is for those in need of a low profile pillow for spinal alignment. All TechnoGel pillows are made in Italy with expert care. Churchill & Smith is a family-owned pillow manufacturer dedicated to making environmentally-friendly products. Utilizing only renewable resources harvested from sustainable forests, the team at Churchill & Smith is able to deliver amazing pillows at great prices. The plush inner filling of their pillows is made of a combination of fibers from Kapok and rubber trees. This combination brings together soft, pliable cotton fiber with a natural tendency to regain its shape and provide extra support. The whole pillow is covered in an extra soft, hypoallergenic knit cover, which is double-stitched for longer life. Churchill & Smith offer both standard and side-sleeper pillows, with the latter specially contoured to naturally fit your body for those that like to sleep on their sides. Bedtech is another outstanding pillow manufacturer. Their iRelax line of pillows features a down alternative filling. Wrapped in a cool, cotton casing, iRelax pillows are breathable to keep you cool throughout the night. The Cooltech line from Bedtech includes three gel/memory foam pillow types. You can choose from low, medium or high profile options to find the best match for your body shape and sleep posture.